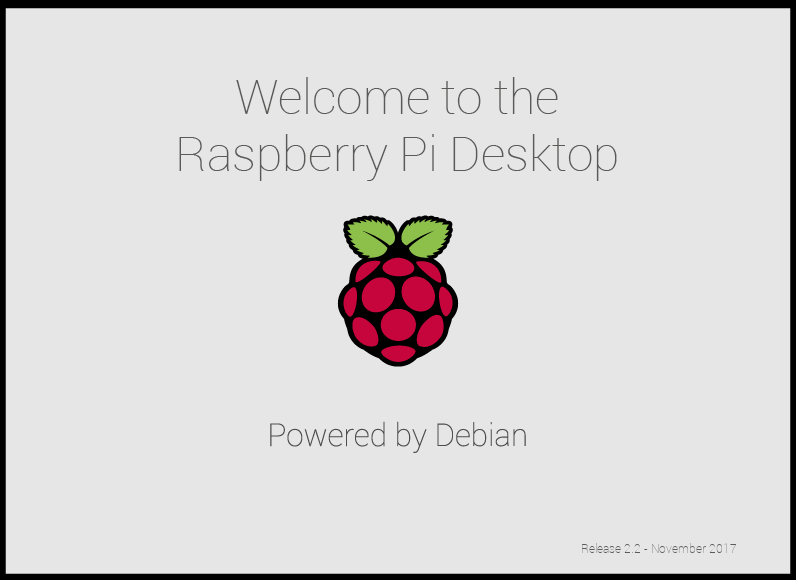 Today, we are launching the first Debian Stretch release of the Raspberry Pi Desktop for PCs and Macs, and we’re also releasing the latest version of Raspbian Stretch for your Pi. When we released our custom desktop environment on Debian for PCs and Macs last year, we were slightly taken aback by how popular it turned out to be. We really only created it as a result of one of those “Wouldn’t it be cool if…” conversations we sometimes have in the office, so we were delighted by the Pi community’s reaction. Seeing how keen people were on the x86 version, we decided that we were going to try to keep releasing it alongside Raspbian, with the ultimate aim being to make simultaneous releases of both. This proved to be tricky, particularly with the move from the Jessie version of Debian to the Stretch version this year. However, we have now finished the job of porting all the custom code in Raspbian Stretch to Debian, and so the first Debian Stretch release of the Raspberry Pi Desktop for your PC or Mac is available from today. As with the Jessie release, you can either run this as a live image from a DVD, USB stick, or SD card or install it as the native operating system on the hard drive of an old laptop or desktop computer. Please note that installing this software will erase anything else on the hard drive — do not install this over a machine running Windows or macOS that you still need to use for its original purpose! It is, however, safe to boot a live image on such a machine, since your hard drive will not be touched by this. We’re also pleased to announce that we are releasing the latest version of Raspbian Stretch for your Pi today. The Pi and PC versions are largely identical: as before, there are a few applications (such as Mathematica) which are exclusive to the Pi, but the user interface, desktop, and most applications will be exactly the same. For Raspbian, this new release is mostly bug fixes and tweaks over the previous Stretch release, but there are one or two changes you might notice. The file manager included as part of the LXDE desktop (on which our desktop is based) is a program called PCManFM, and it’s very feature-rich; there’s not much you can’t do in it. However, having used it for a few years, we felt that it was perhaps more complex than it needed to be — the sheer number of menu options and choices made some common operations more awkward than they needed to be. So to try to make file management easier, we have implemented a cut-down mode for the file manager. Most of the changes are to do with the menus. We’ve removed a lot of options that most people are unlikely to change, and moved some other options into the Preferences screen rather than the menus. The two most common settings people tend to change — how icons are displayed and sorted — are now options on the toolbar and in a top-level menu rather than hidden away in submenus. The sidebar now only shows a single hierarchical view of the file system, and we’ve tidied the toolbar and updated the icons to make them match our house style. We’ve removed the option for a tabbed interface, and we’ve stomped a few bugs as well. One final change was to make it possible to rename a file just by clicking on its icon to highlight it, and then clicking on its name. This is the way renaming works on both Windows and macOS, and it’s always seemed slightly awkward that Unix desktop environments tend not to support it. As with most of the other changes we’ve made to the desktop over the last few years, the intention is to make it simpler to use, and to ease the transition from non-Unix environments. But if you really don’t like what we’ve done and long for the old file manager, just untick the box for Display simplified user interface and menus in the Layout page of Preferences, and everything will be back the way it was! One important feature missing from the previous release was an indication of the amount of battery life. Eben runs our desktop on his Mac, and he was becoming slightly irritated by having to keep rebooting into macOS just to check whether his battery was about to die — so fixing this was a priority! 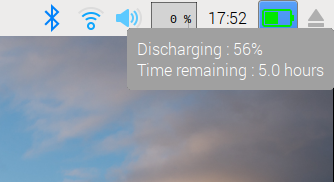 We’ve added a battery status icon to the taskbar; this shows current percentage charge, along with whether the battery is charging, discharging, or connected to the mains. When you hover over the icon with the mouse pointer, a tooltip with more details appears, including the time remaining if the battery can provide this information. While this battery monitor is mainly intended for the PC version, it also supports the first-generation pi-top — to see it, you’ll only need to make sure that I2C is enabled in Configuration. A future release will support the new second-generation pi-top. We have included a couple of new applications in the PC version. One is called PiServer — this allows you to set up an operating system, such as Raspbian, on the PC which can then be shared by a number of Pi clients networked to it. It is intended to make it easy for classrooms to have multiple Pis all running exactly the same software, and for the teacher to have control over how the software is installed and used. PiServer is quite a clever piece of software, and it’ll be covered in more detail in another blog post in December. We’ve also added an application which allows you to easily use the GPIO pins of a Pi Zero connected via USB to a PC in applications using Scratch or Python. This makes it possible to run the same physical computing projects on the PC as you do on a Pi! Again, we’ll tell you more in a separate blog post this month. Both of these applications are included as standard on the PC image, but not on the Raspbian image. You can run them on a Pi if you want — both can be installed from apt. New images for both Raspbian and Debian versions are available from the Downloads page. At several points during the upgrade process, you will be asked if you want to keep the current version of a configuration file or to install the package maintainer’s version. In every case, keep the existing version, which is the default option. The update may take an hour or so, depending on your network connection. As with all software updates, there is the possibility that something may go wrong during the process, which could lead to your operating system becoming corrupted. Therefore, we always recommend making a backup first. Enjoy the new versions, and do let us know any feedback you have in the comments or on the forums! Should “Today, we are launching the first Debian Stretch release of the Raspberry Pi Desktop for Windows and macOS,” and the heading “For Windows and macOS” both read “for PCs and Macs” instead? I at first thought we’d be able to run the Pi desktop under Windows and got very excited. Ooops – yes, you’re quite right. Now changed – apologies for the confusion! And everywhere else in the article where it says PC it means PC/Mac, right? That was confusing. Yes, for “PC”, read “PC/Mac” – PC is being used in the sense of “personal computer” as opposed to “device running Windows”. Right, thanks. That was what I expected, except it explicitly says PCs and Macs in the title. Hmm, running the Pi Desktop on Windows should be possible now with the Linux subsystem in the fall update. You have to install Linux from the MS store and the a X Windows server, with that done you can already install and run for example the xfce desktop. Would just need the Pi environment packaged for install on Ubuntu. Thanks for this. Are there any longer term plans to move over to, or at least provide the facility to easily choose LXQt or MATE at installation on the Pi version? No. We’ve invested a lot of time and effort in an LXDE-based solution, and see no reason to change; it works very well for what we require. What about Wayland/Weston? LXDE seems like a dead end to me. LXDE is a mature, working, stable desktop environment which does everything we need it to. This notion of “dead ends” is not one to which I subscribe – what you call a “dead end” is what I call “stable code”. We investigated Wayland several years ago and decided that it didn’t do anything we needed and was too bleeding-edge to move to. Until such time as we need to do something that LXDE doesn’t handle – and I don’t anticipate that being any time soon – we will stick with the desktop environment that I have now spent over three years tweaking, debugging and improving. “Newer” is not the same as “better”, certainly not in the world of software. Simon, et al, I’ve been using Linux since v1.0, having a stable GUI which just does the job has held wider adoption of Linux back for as long as I can remember. Most GUI’s [or window managers] are just TOO complicated for the average user. Having a GUI on a Pi and a PC that looks and works just the same way is absolutely fabulous for people learning computing for the first time. Absolutely stunning job. I run Hour of Code and coding taster classes at STEM events, all the laptops we use for these run Pixel x86, fabulous!!!. That’s very kind of you to say so, Roger – I’m glad it is useful for you! It’s just that LXDE is getting a long in the tooth now, and having the options of LXQt or MATE (Look how popular Ubuntu MATE is) would add more options for users. I know its not an essential thing, but MATE is already in the repositories, so would have thought it would be a nice option. This is brilliant news! Very happy to see you guys are keeping this alive. usbbootgui is the program referenced above which enables you to use the GPIO pins of a Pi Zero as remote GPIOs from a PC. We’ll have another blog post with more information on that in a few days time. Specifically this :) Do you mean this will work the same from a PC or a Mac? Thanks. We can’t guarantee that usbbootgui will work on every Mac – some Mac hardware seems to be a bit fussy with Debian images – but it certainly works with my 2014 MacBook Pro. Is there a way to donate for this? Very good to have Debian Stretch as the base for the x86 Operating System. Still confused, even after 12 months, why Posters call it Raspbian, Raspbian is a fork of Debian ARMHF !! If you are talking about donations of company laptops: as. Code Club organiser in a small primary school – I have recycled some very old windows computers for use of yr3 &4 students and looking for 3 or 4 more. We are based near Loughborough. The students would be very grateful. It runs in 64bits or it is 32bits like the Raspbian for Raspberry Pi? It’s 32-bit, but will also run on 64-bit machines. Can we ever get the temperature monitor to be in Fahrenheit? The temperature monitor isn’t part of the desktop that we use or modify – we don’t support that plugin. So no, not unless the authors of the underlying LXDE environment decide to support Fahrenheit and push it into the parent Debian distribution. I also wouldn’t rely on the plugin on Pi, as I have no idea if it talks correctly to our hardware. To be honest, converting the value in a plugin from Celsius to Fahrenheit is a trivial mathematical exercise, so perhaps you could take the opportunity to learn some coding and do it for yourself? Just a suggestion, but it would be an excellent way of learning about lxpanel plugins! E.g. : I just booted from usb stick on my old Macbook (“Late 2007” white plastic) and it looks great. But not quite ready for hdd install because I can’t figure out how to right-click. The touchpad doesn’t recognise one-, let alone two-finger click. Primary (left) click does work because there’s a physical button below the pad, but it’s just the one. Modifier keys (ctrl/alt/cmd) don’t work. Two-finger swipe up/down for scrolling does work! Problems like the one you describe are driver issues in the underlying Debian distribution – we don’t have the resource to take on making every Debian driver work correctly on every possible piece of x86 hardware. You would be better off reporting it to the Debian maintainers, or looking for a solution which already exists in Debian – many pieces of Apple hardware have patched drivers which other Debian users have developed, but which aren’t part of the core distribution. Yeah all right. I just tried Lubuntu 17.10 x86_64 with kernel 4.13 and the touchpad works well for both one and two finger (secondary) clicks. Perhaps I’ll try & make your stuff (usbbootgui) work on that. You might find it easier to just find which driver Lubuntu is using for the trackpad and install it on our desktop. Is the source for the lxde modifications/addons available somewhere? Looks great. Will it work in a VM environment like HyperV? It’s been tested under VirtualBox and mostly works fine – a few minor driver issues, but nothing serious; certainly nothing you wouldn’t get from running vanilla Debian in the same way. So it should run under any virtualisation environment which can run standard Debian Stretch. I wanted to play with the Desktop version on my normal PC using Virtual Box and it installed no problem except I can’t seem to change the display resolution – when I run what I saw as instructions on a youtube video – using Xrandr (https://www.youtube.com/watch?time_continue=10&v=0fCr1C2vtsY) it would return an error Gamma not found or similar. How can I change the default resolution to something larger than 640 x 480 .. I am guessing the Desktop is testing the connected monitor and in virtual box there is no response or one that is not understood? From memory, you need to install the “guest OS additions” for Debian to the virtual machine, and you should then be able to just drag the Virtual Box window to whatever size you want. That worked for me, anyway. VirtualBox Extensions does allow screen resizing, works a treat. Restart VirtualBox after installation and restart your Pixel VM – install GuestAdditions from inside Pixel x86 first. You can even enable Remote Desktop – change the listening port to something other than 3389, because that clashes with the host machine, Oracle recommend port 5000, then just RDP to the IP address of the host machine on port 5000. I run the previous version in a VM with no issues on an i7 laptop. Works perfectly on VMWare Workstation 14. After the update, the oldconfiles folder appeared in the home directory and some settings changed, how can they be recovered? What to do with the folder? The oldconffiles folder contains a hidden directory called .config – copy the files from there into the .config directory in your home directory to restore previous settings. On my EEE PC I was unable to activate an external monitor. Will this release fix it, or where should I hunt for solution? I’ve used an external VGA monitor with the Jessie release running on my EEE with no problems – it was a while ago, so I can’t remember if I needed to do anything special in terms of setup, but I don’t think I did. With any hardware issues, all we are doing is using the services and drivers offered by the underlying version of Debian, so it is best to direct any queries about hardware problems to the Debian maintainers or forums. An AMD64 version would be very cool. When I use “sudo apt install -y raspberrypi-ui-mods”, it install automatically also the desktop environment or I need to install lxde before? You really need to start from an image with the desktop already installed. It is possible to install the desktop manually over an image without it, but it’s a complicated job and will almost certainly go wrong! Just installing ui-mods is very unlikely to work. That’s a sensible approach – Debian with LXDE is a good starting point. Thanks, It works! For round corners on openbox, what should I do? If that’s already there (which it probably will be if ui-mods installed correctly), you’ll need to update openbox to the version in our repo – sudo apt-get install openbox should do it. Lot of people are having trouble installing MQTT on Stretch. Is there any help with this problem. A quick look at packages.debian.org reveals that there is no version of libwebsockets3 in stretch; it is only present in jessie and sid. The same is true of libssl1.0.0. However, there is a stretch version of mosquitto which uses libssl1.1 and libwebsockets8. For some reason you appear to be trying to install the jessie version of mosquitto rather than the stretch one, and the jessie version will not work on stretch. The stretch version does appear to be built for ARM and is available on the Raspbian apt repo, so it looks as if you have problems in apt getting the wrong version for some reason. I’d suggest you try again on a clean stretch image – I suspect that you are using an upgraded image in which the upgrade failed somewhere and left apt in a bad state. You need to do sudo apt update and sudo dist-upgrade to avoid the problem, just an apt upgrade doesn’t cut it. I’ve put a fully worked upgrade and install from September image on the forums – and it works without workarounds, bodges or symlinking. Did a fresh install on an old vaio p series machine. Got a black screen and hung (no disk ios) after boot. Tried adding nomodeset in the boot grub parameter but to no avail. Will try to update the June Debian 8 version ti the new version and see if it makes any difference. On another acer aspire one machine, the new live version does not have this issue. How do you set a proxy? I’m running in a VM and need to configure a proxy, but there’s really no place to set a proxy up that I can find. As far as I am aware, Debian does not support a global proxy server setting; you need to configure it in individual applications. Then log out and back in again and see if the programs you use work via proxy. If not, then as mentioned, that program does not look for these environment vars. In which case the developer who wrote the program has their own way of specifying a proxy such as with a config file in /etc or with command like parameter. Or the program simply does not support using a proxy. You’ll have to google for some other options. I figured out how to get a higher video resolution at boot, it defaulted to 640×480 in my installation. This post may be of use to you. With Oracle VM VirtualBox, I still have 640×480 resolution. Back to Jessie for me. Ha! RTFM. I had selected a video resolution that wasn’t available. 1280×1024 works OK, but it’s not as good as the 1920×1080 I had with the Jessie configuration (which is not an available video mode under Grub, unfortunately). You might be able to get a higher resolution after you have loaded any card specific video driver. Without the driver, GRUB may have only access to lower resolutions. There should be GUI tools to change the X desktop resolution. Also, if running in a VM, check that you have allocated enough video memory for the mode you want. If I want to run this from a USB stick, what are the minimum and optimum sizes? Thanks. I’ve never run on anything less than an 8GB; it might just fit on a 4GB, but would be tight. 1. Download the file from the downloads page using the Torrent or ISO link either of which will give you an .iso file. 2. Make sure the stick has a GUID partition table or it can’t be used as a boot disk: use Disk Utility to “Erase” it and select GUID, not MBR or Apple. Format (macOS journaled / MS-DOS FAT) doesn’t matter. 4. Reboot, hold ⎇ Alt when starting up and choose the (first) orange/yellow USB-disk icon labeled “EFI Boot”. Is some window video player with VA included/supported? There’s no GUI video player; you can play videos from the command line with hardware acceleration using OMXplayer. That’s not much convenient, isn’t it. We have a limited amount of resource, and an almost infinite number of things we could do; things get prioritised. If it’s really inconvenient for you, you could always write one yourself. You can build a version of VLC from source which includes acceleration, but even then it plays full screen. OMXPlayer and this option are still very good considering the price point. OMXPlayer suits me as I don’t use Pixel. The x86 version of the Raspberry Pi Desktop is basically Debian 9 with some customisations Raspberry Pi have developed for it. You therefore have access to all of the various media players that are available on a “normal” installation of Debian 9. My issue of getting a black screen after boot on my vaio p series machine has been resolved. It was related to the vga cable connected to the external monitor. It was not totally not working, just during boot. Odd. I just replaced the cable. Now the new version of rpi desktop is running on my three old machines. So far no issues. Thanks gor the great work! Much appreciated. The machine has a straight forward stretch lite install from about 2 months ago. Yes, it works as a live image – you’ll need to burn to a DVD, as it is too big for a CD. Thanks very much folks. I understand thid required a lot of work by many people. Trouble free installation, apart from the failure of conversion, which took a long time. Therefore, I just installed the new .iso image as a new machine in VirtualBox. This automatically allows resizing the desktop to your display, by installing Guest Additions as described in the manual. Works well on an old Centrino Duo laptop. Is it possible to install node.js and nodered on this version of the OS? Where could I get instructions on how to do that? There is a Debian package for node.js so “sudo apt-get install nodejs” ought to work for that. I believe you then need to use the npm installer which is part of node.js to install node-red – https://nodered.org/docs/getting-started/installation suggests this is “sudo npm install -g –unsafe-perm node-red”, but I’ve not tried this myself. Thanks for that Simon. I’ll give it a try! After re-adding my appearance preferences I am happy with this upgrade! Simon, is there anything those of us with the 2nd generation pi-top can do to help add support for the battery indicator? Thank you for the offer, but it’s in hand – I’m working on it with the guys at pi-top at the moment, and we hope to have something available in the near future. For the past couple of days trying to rpi-update a new install but the download breaks off every time. (apt upgrade does work.) Probably a time-out? Busy because of millions of Pis hitting your servers..? Hm, didn’t want to test rpi-update with other Pis, but that did work for a Pi3 (not working was a Pi0 non-W). So it’s probably me; network or sd card trouble I guess. Is there an interesting reason why PC Stretch runs Julia 0.4.7 when RPi3 Stretch has 0.5 or 0.6 (I’ve forgotten)? It doesn’t matter to me- my Julia requires only 0.0! Does the Julia compile just await its turn? 99% of the packages in Raspbian are pulled straight from Debian’s repo and recompiled for ARM. In some specific cases, we make Pi-specific modifications or pull in newer packages – this is usually because some other package we install requires a particular version, or someone has reported a problem with a particular version which is fixed in a newer one. I can’t off the top of my head recall why we have an updated julia package, but you are quite correct that we do! Dell Dimension 9200 x86 PC which will “”run”” Windows 10, absolutely flies in comparison when running from DVD. The ‘Raspberry Pi Desktop’ keeps evolving which is good to see and though some have asked for it to be based of LXQT instead of LXDE I must say that my personal opinion, having used Distro’s with LXQT, LXQT is far from polished at this present time. Has anyone considered getting this to work with Crouton for us Chromebook users? Now that would be a boatload of work! Possibly a project for a comp sci class. It would be fun, but since nearly all Chromebooks can now run Android apps, not really useful. Great this is working very nice on an old centrino (386) latop from 2006. What I dearly miss: how do I enable multiple desktops/workspaces? And it would be nice if we can try the new Firefox Quantum instead of the rather old 52 esr version. Should be faster. There is a desktop switched plugin for the taskbar – if you install that by right-clicking the taskbar and choosing “Add / remove taskbar plugins”, you’ll be able to add new desktops. The version of Firefox available is that in the default Debian Stretch – as Debian updates its version, it will become available in the desktop. I could find a `desktop pager plugin` but could not add desktops with it. So I edited `config/openbox/lxde-pi-rc.xml` and tweaked the desktops>number tag. Now I need to tweak the shortcuts, default one for switching are stolen by window placement left/right. That said: `send to desktops` is still working. I am having some problems with the keyboard layout. For example, when I try to enter an double quote I get an at sign. The AT sign on the keyboard (shift 2) is the double quote. How can I fix this? I’ve played with the Localization settings in raspi-config and haven’t found the right combo. I am running this on “US” computers, for example an HP Probook 6460. If you haven’t done so already, look into correcting the system preferences and localization options on the PC just as you would on the Raspberry Pi. Today, I could boot up this “new light OS for Debian” from my favor USB memory ( only 8GB size). I feel this OS is so quick motion and so simple that I love this OS. One thing that I am looking for the solution – how to change the rotation of display in any related file. For your reference, regarding to the RPI 3B board. I could complete the change in the Config.txt in the boot folder ( specifying the 270 degree rotation ). Everyone, if you have any idea/solution – pls let me know it. You should be able to do that by setting a transformation matrix in xrandr – “man xrandr” should tell you how. I’m just starting with the Raspberry Pi and thought it would be useful to add Raspberry Desktop to my dust-gathering, Vista-driven Packard-Bell laptop. I managed to install Debian Jessie without any problems, leaving Vista on. However, further on (How to get the new version), it says that the existing Jessie can be updated to Stretch by doing a distro upgrade. It doesn’t, however, contain a warning that Stretch will overwrite everything else on the target hard disk. My (fairly obvious) question is can I upgrade the distro from Jessie to Stretch whilst still leaving Vista alone in its own partition and still available as a boot option from GRUB? Please assume I know nothing about Linux, as I’ve only had Jessie up and running for a day and haven’t yet run my RPi. If you follow the instructions at the bottom of the post for how to update an existing Jessie image to Stretch, that will only affect your Jessie partition; it won’t affect any other partitions on the drive. Thanks, Simon. All seems to have gone well with the installation. I have Stretch and I’ve still got Vista. It’s interesting to note how much quicker Stretch is than Vista. 1) I am constantly getting UI crashes when using SMALL ICON view and drag-dropping several files into a folder. This ‘crashes’ the desktop gui every time. It never used to crash before update. It does not crash when I use ‘detailed list’ view. 1) I’ve just tried this on a Pi here – I created 4 files called “a”, “b”, “c” and d” in /home/pi, and an empty folder called “test”. Using small icon mode, I was able to select the 4 files and drag them into the folder with no problem. Is there something more specific I need to try? 2) If you want tabs, turn off the “cut down” UI option. We know that not everyone will like all of the changes, which is why you can turn them all off. But it isn’t possible to offer each individual change as an option – there are just too many permutations, so it is all or nothing, I’m afraid. Hello Simon, Thank you for replying ! 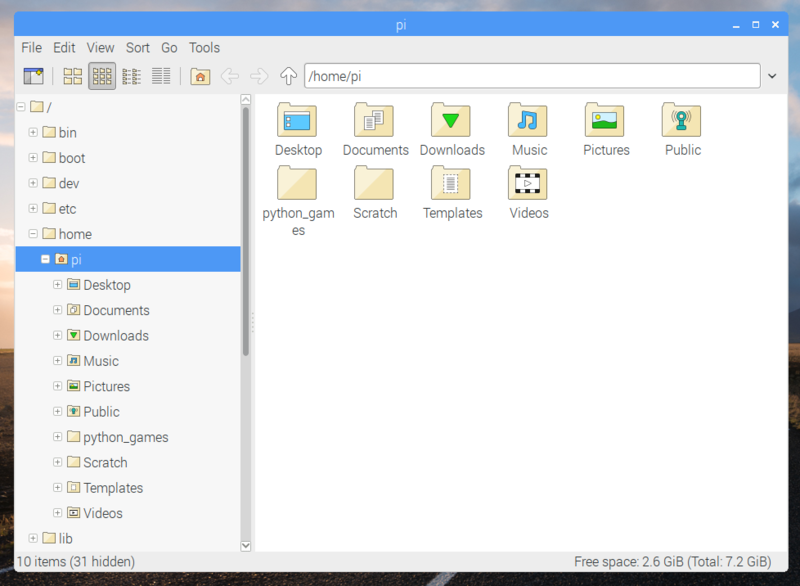 1) I do not have any issues if I create blank files and move them in and out of a folder in small icon view. However, if I select a few PDF files and a few text files (.txt and .md) and move these into a folder—the GUI does like a mini-crash, and then pops back up, only the file manager is always gone at this point. The files themselves I have no problem editing or opening and all have been created on the same pi using leafpad, focuswriter and pandoc (for the pdf). Also, I’ve noticed that when I boot up my pi, it now does a disk check, whereas before it never did that–and as long as the GUI doesn’t ‘crash’ is won’t do it—so there seems to be a correlation. 2) I spent a half hour last night looking for the Layout Preferences menu pictured in the above blog post where I can supposedly revert back to the old file manager. (I don’t really need to, its not mission critical)—but I can’t find this menu for the life of me. 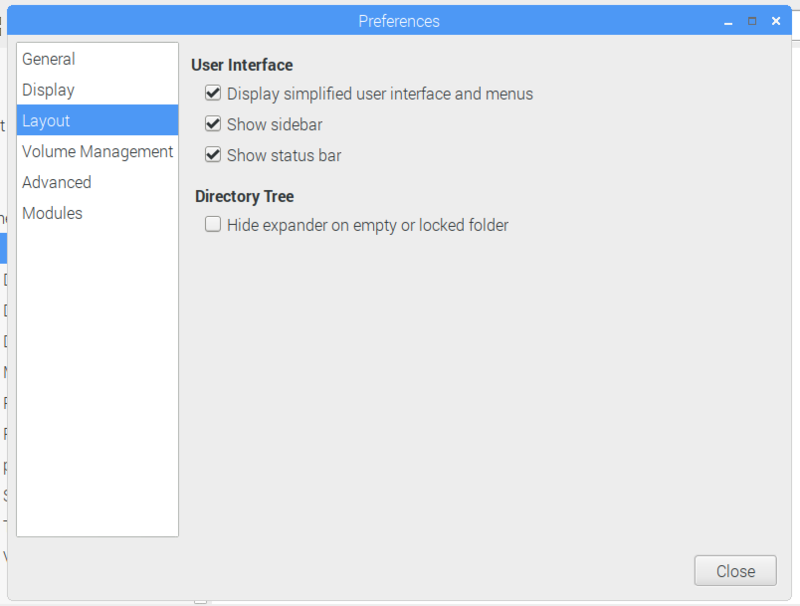 I’ve looked in Raspberry Pi Configuration, Appearance Settings, Theme and Appearance Settings, Main Menu Editor, Desktop Preference, Desktop Session Settings…. I can’t find this preference menu that has the Layout menu anywhere…??? 1) OK, I’ve now been able to repeat it – it doesn’t happen all the time, but does sometimes. Nothing I have changed should have affected this behaviour, so I suspect this is a result of things moving around in memory and some uninitialised variable or similar now being in a place where it gets clobbered. gdb isn’t providing anything helpful in the way of a backtrace, so this is going to be time-consuming to debug; I’ll have a look at it in the New Year. 2) It’s in the file manager’s own preferences – open a file manager window and choose Edit->Preferences. Layout is the third tab. Hello Simon, again I really thank you for taking the time to reply to both of my questions. You guys at Pie Headquarters have a great approach to customer service and cultivate the market with tact. Just to let you know – I’ve found the bug that was causing the crash, and I’ve created a fix; we’ll get this up into our apt repository in the next couple of weeks once we’ve done some more testing to make sure I haven’t broken anything else in the process! Many thanks for reporting it. Thankyou guys! I have been trying intermittently over recent years to find a Linux distro which runs properly on an old Compaq Mini I had lying around. Most distros I tried either didn’t fully support the machine or were just too slow. Stretch runs perfectly – good job! Thanks a lot for the fantastic Piserver-application. Since approx. 1.5 years I manage a computer class room with 19 RPI3 in our Rudolf Steiner / Waldorf School. a) how can I create approx. 120 user names and passwords for our students? b) how can I group these 120 users into four classes with two groups each? c) how can I assign static IP addresses to each of the RPI-Clients, so that I can use VNC-Viewer from the teacher’s desktop? d) how can I provide the teacher with easy access to the files in the home directories of his students? e) can I simply run “apt-get update” from the chroot-Console of a Raspbian OS in Piserver? Thank you very much – and Happy New Year. I’m running my pi zero headless. I can’t find anything that helps me understand how to get access to the desktop headless. Ive enabled VNC through raspi-config then tried to access from real vnc. I’ve started the realvncserver I’ve tired tightvncserver etc. Where can I find info on how to go about this. I’ve been working on this since last Saturday. The new Stretch release for PC doesn’t come with Minecraft pi. How do I get it? It was a great disappointment when we found out minecraft pi doesn’t come with Stretch. I’m afraid it’s never been available for PC – we don’t have a licence for it on platforms other than the Raspberry Pi. Thank you so much for this excellent Stretch, Simon! What about future optimisations under-the-hood in Raspbian Stretch ? Slightly confused! I already have a battery indicator and neither of the files specified refer to Raspbian. Hello I installed under Virtualbox Raspberry Pi Desktop for PC and get the Gasterweiterung not installed, knows one advice there? How do I create an image to load into PiServer? There are options within PiServer to use a Repository or external file, but I’m unsure how to generate this from a Rasbian image I’ve create with all my settings and software on already. This distribution is just plain awesome ! It runs like a charm inside a VirtualBox, I’ll try it on a real low spec hardware, to see how it goes. But that could very well be what will save my mum’s old latptop !